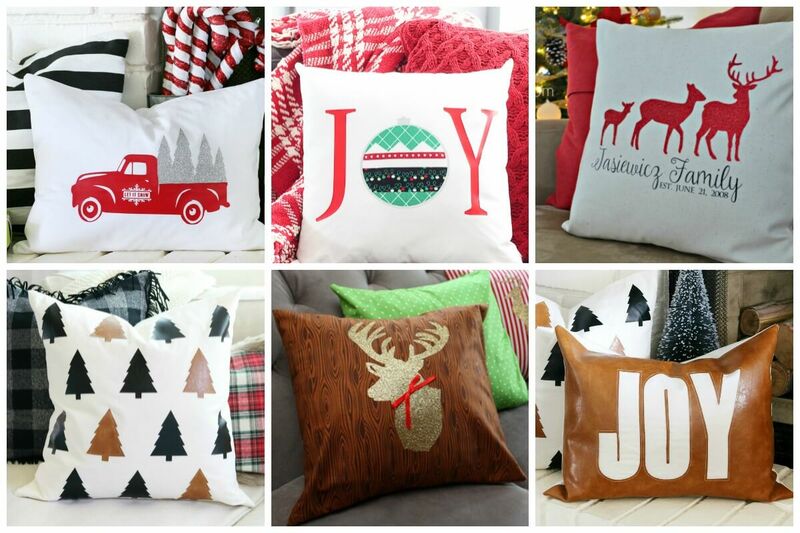 These Cricut Christmas pillow projects are just the thing to bring the holidays home. Some are so easy, you can make a few for yourself or give as gifts. Christmas Crafting Is My Favorite!!! If I’m honest with you – and I like to be honest here on Ruffles and Rain Boots – it is August 11th and I am writing this because I was just planning this year’s Christmas crafting. It’s just that I love crafting for the holidays, making handmade gifts like our popular DIY bath bombs or any of our other holiday crafts. 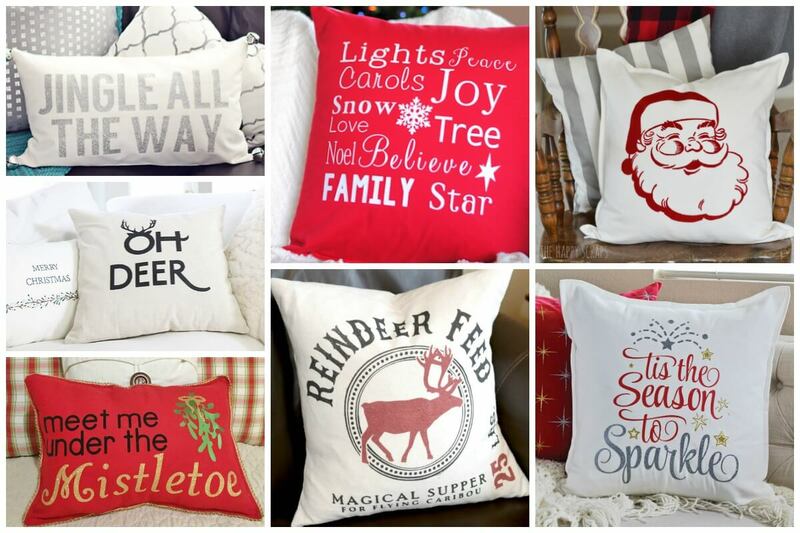 Enough of my blathering – it’s time for some adorable (and easy) Cricut Christmas pillow projects. Note: you can use a Silhouette or any other cutting machine, too. Pick up your blank pillow inserts here – I bought these inexpensive pillow inserts because of all the great reviews and they don’t disappoint. Check out my list of the best blanks for holiday projects – includes aprons, signs, and so much more! 1 – I love this faux leather tree Cricut Christmas project idea for anyone with a farmhouse decor or a rustic holiday decoration theme. It’s perfect for a neutral holiday palette or to be used as an accent in an entryway for the holidays. 2 – When someone shares a hack to make my crafting easier, I am a fan for life. This adorable no-sew Christmas pillow looks hard but her trick makes it doable. 3 – Okay, so I have another faux leather Christmas pillow project using a Cricut for you. LOVE that it coordinates with my other favorite leather pillow on this list. Her design style is simple and clean – love it. 4 – I’ve found a friend. She’s as hooked on glitter vinyl as I am and shows it with these Christmas deer pillows. 5 – The family ties in this DIY deer family holiday pillow are strong. 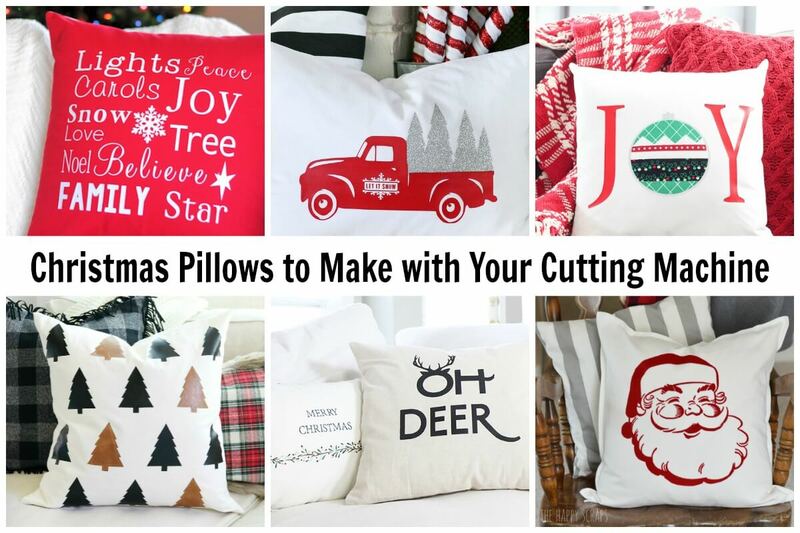 I love that it can be used as an heirloom and it’s one of the best Cricut Christmas pillow projects for gifting. 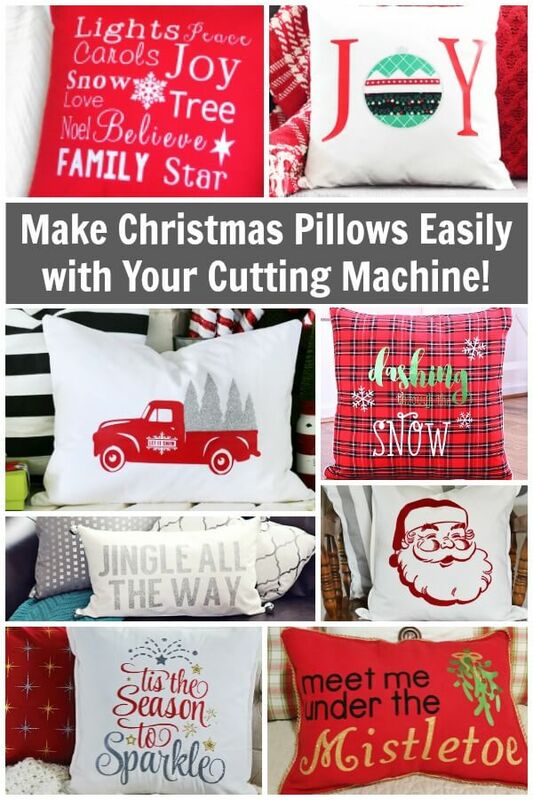 6 – If you have seen my free Christmas SVG files, you know I’m a huge fan of the rustic Christmas truck and this Cricut Christmas pillow design calls to me. 7 – The understated design of this “Oh Dear” holiday pillow would be a perfect holiday gift! It’s simple enough to go with so many design styles and holiday themes. 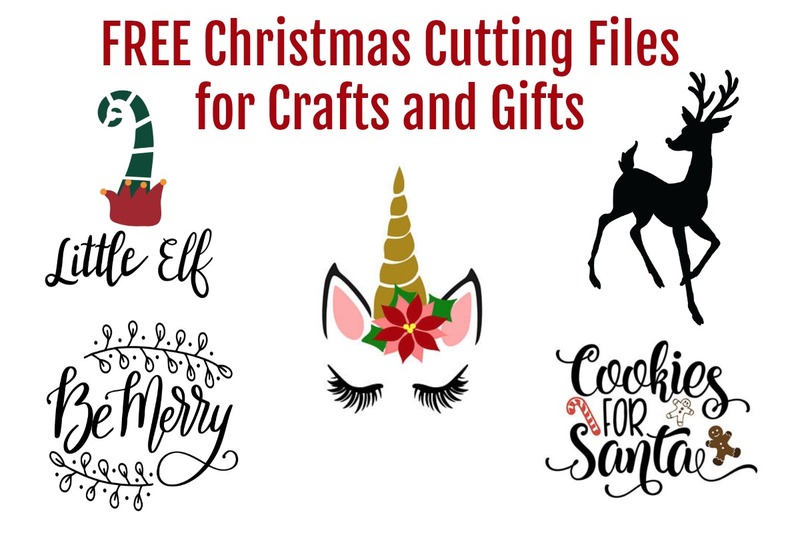 8 – Her free cut file makes for a fun weeknight project! Plaid or not, this “Dashing through the snow” pillow is one of the easiest Cricut Christmas pillow projects shared here. 9 – Hmmm… Glitter? Check. Simple? Check. Work with any decor? You bet. This Christmas pillow is too good to pass up. 10 – This might be one of my favorite projects. It only took her 20 minutes and she created this sparkly, glittery, vinyl-transfer holiday pillow! 11 – This holiday subway style pillow would be a quick craft for any seasoned cutting machine user. Remember: the thinner the font, the harder the project, so if you need something quick, change the fonts. 12 – What a clever use of pompoms. Seriously, this might be my next project because these holiday ball pillows are too cute. 13 – The SVG files for these pillows are too cute, vintage, and have my heart. Make one of her DIY spray-painted Christmas pillows. 14 – This. Started. From. A. Placemat. and it’s adorable. A “believe” holiday pillow is something all homes should have. 15 – Awww, this is adorable. And really, is there enough mistletoe in the world? If you don’t think so, you should make this mistletoe pillow with your Cricut or Silhouette machine.